KUALA LUMPUR (Nov 3): The FBM KLCI extended its gains in early trade on Monday, in line with the positive sentiment at key regional markets. At 9am, the FBMKLCI added 1.67 points to 1,856.82. The top gainers included UMW, Petronas Dagangan, PPB, JobStreet, DiGi, Maybank, Tenaga, Sime Darby, Eupe amd Seacera. Regionally, the U.S. dollar touched seven-year peaks versus the yen on Monday as markets basked in the afterglow of the Bank of Japan's surprise stimulus push and looked forward to at least a hint of fresh action from European policy makers this week, according to Reuters. The dollar came within a whisker of 113.00 yen in early trade, reaching a high not see since December 2007 and bringing into view that month's peak of 114.66, it said. BIMB Securities Research in a market preview Monday said Asian markets were also mostly last Friday higher from the Japanese effect. 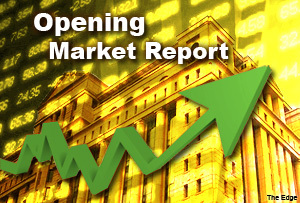 Locally, it said the FBM KLCI improved by 12.37 points to 1,855.15 buoyed by regional buying. “Friday’s trading saw continued foreign buying with a net foreign participation of RM180.2 million pushing a net foreign inflow for the week to RM460 million. “For today, we expect more upside for the local bourse following the solid closing in the US and Europe and expect the index to re-test the 1,860/70 region soon,” it said.